HARLINGEN — Burger King Inc. has taken the extraordinary step of suing one of its biggest franchisees to force the sale of its 37 South Texas restaurants. The Valley Morning Star was unable to obtain a list of those restaurants. It is likely there are Burger King restaurants in the Valley owned by other franchisees. The lawsuit follows media reports surrounding an employee video which was broadcast on Telemundo 40 in February showing rats and baby mice in a restaurant in Harlingen at 1902 S. 77 Sunshine Strip. The location closed temporarily for fumigation and cleaning and reopened last week. Restaurant Brands International Inc., Burger King’s parent company, filed suit Friday in federal court in Florida against Irving, Texas-based Fritz Management LLC and Guillermo Perales, CEO and president of Dallas-based Sun Holdings Inc. But Wednesday, a lawyer for Perales said the recently remodeled restaurant has passed two subsequent health inspections within the past 45 days and meets all state and local standards. He said the problem was created by improper sealing of walls and duct work during the remodeling, allowing rodents access to the restaurant. Emails to Burger King for comment Wednesday went unreturned. 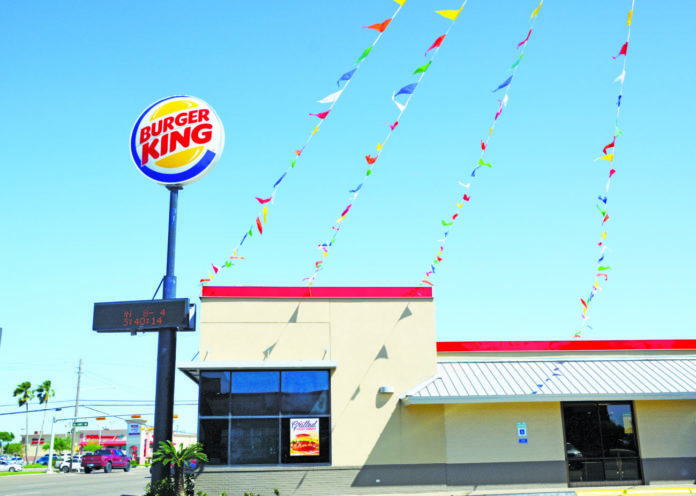 Burger King wants Fritz Management and Perales to remove all Burger King signs and trademarked items from restaurants in Harlingen, Brownsville, McAllen, Pharr, Weslaco and several other South Texas cities. Sun Holdings is a multi-brand company with nearly 900 franchises including Burger King, Krispy Kreme, Arby’s, Cici’s Pizza, Popeyes, Golden Corral, T-Mobile and GNC. The company recently acquired Taco Bueno, which had filed for bankruptcy. Zarco said his client invited Burger King to do its own inspection of the Harlingen facility, and said to his knowledge the parent company did not pursue the offer. He blamed an “ulterior motive” for Burger King’s attempting to force his client to divest himself of his 37 South Texas locations. Zarco alleges Burger King is moving against Pareles to force him out of the South Texas market completely in order to shift the franchises to other owners of its choosing. “I don’t want to be speculating at the highest level of speculation, but in our view, for some reason the restaurants my client is being asked to sell are restaurants that we believe Burger King is looking to give to other franchisees in that market, or other people that Burger King has a special relationship with,” he said. Zarco said Burger King is pressuring franchise owners to open more restaurants.